A South African police clearance certificate (PCC) is required for a variety of immigration or emigration applications. The document serves to prove that the applicant is of sound character, and is not deemed to be an undesirable person in terms of the law of the host country. 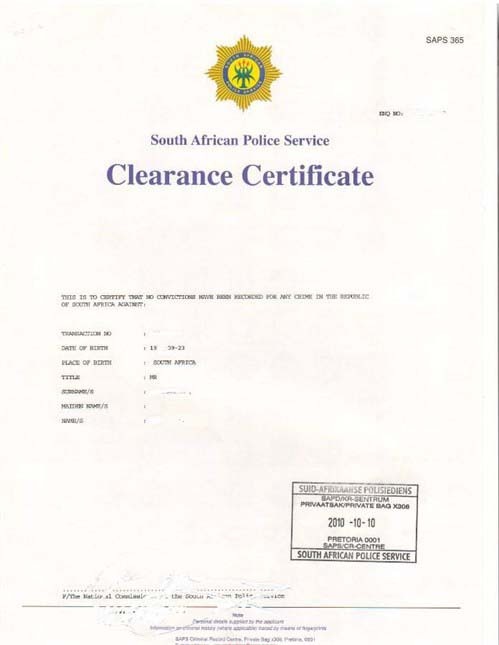 A South African police clearance certificate takes approximately four weeks to be processed. On completion, the certificate will be mailed to the applicant by post. Individuals abroad are responsible for their own postage. Applicants can arrange for the certificate to be collected via courier service at their own expense. The SA police clearance certificate is valid for 6 months from issuance. For assistance with your South African visa application, contact our offices, or visit SAPS for more information on police clearance certificates.